Knight School is back for 2019 at the Tower of London! 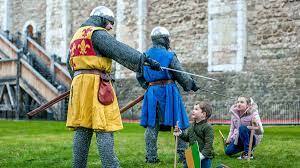 Come to the Tower of London this February half term and join their Knight School! You’ll begin your training as a page. Impress your Lord or Lady with good manners as you serve at the dinner table! You’ll also get to entertain them with your funniest joke or dazzle with your dance moves! Work your way up to a squire – learn to fight, proving that you are fit enough to become a knight of England! Do you have what it takes to become a master of the sword? Eventually you are worthy to become a knight and to join the garrison to Defend the Tower! You’ll get to try on medieval fashions and handle replica armour and other real medieval objects. Pick up a knight’s craft pack and be inspired by the coats of arms and armour around the Tower to create your own helmet or shield. Knight School activities are recommended for children aged 5-11 and their families. Entry is free with your ticket to the Tower! Knight School runs at 11:00, 13:00 and 15:00 on the South Lawn. Your chance to defend the Tower comes at 11:30, 13:30 and 15:30. At the Lower Bowyer Tower, you’ll get to try on a Medieval wardrobe between 11:00 and 16:00. In the White Tower between 11:00 and 15:30, you’ll have the chance to handle loads of historical artefacts. « Say goodbye to 2018 and welcome 2019 with Seven Stories!